Brrrrrr! Chilly mornings are a sure sign that Fall is upon us. While most trees have yet to display their characteristic colors, below their leafy canopies, fall-blooming cyclamen and roscoeas light up the Woodland Garden here at Heronswood. 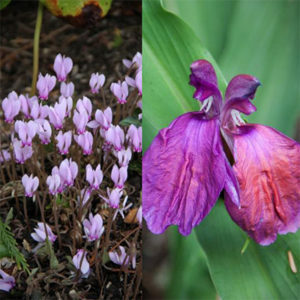 Both have blooms in shades of pink, purple and white and both can be found scattered widely throughout the garden. Cyclamen hederifolium is the common autumn-flowering species and gets its name from the ivy-like foliage (ivy is in the genus Hedera). Cyclamen leaves are incredibly variable, both in shape and color, and may be delicately etched with silver or entirely unmarked. The nodding flowers have their petals swept backwards, so resembling our native shooting-stars (Dodecatheon); both are members of the primrose family. But their most outstanding feature is their ability to thrive in dry shade and for Pacific Northwest gardeners, labouring under Douglas fir and cedar, this makes cyclamen indispensable. Cyclamen survive summer drought by disappearing underground where disc-shaped storage organs, known as tubers, provide sustenance. These tubers, which develop from the stems, are popular with pigs and boars earning cyclamen the common name ‘sowbread’. Roscoeas also produce tubers, but these form from swollen roots. As members of the tropical ginger family, they bring a touch of the exotic to the garden, but are reliably hardy. Blooming now, Roscoea purpurea has the largest flowers in the genus. As the name ‘purpurea‘ suggests, they are typically purple, but our Heronswood plants come in a range of shades, from purple to red to white and are the product of director Dan Hinkley’s experiments in cross-breeding. Hurry along to Heronswood to enjoy a wealth of late season colour. 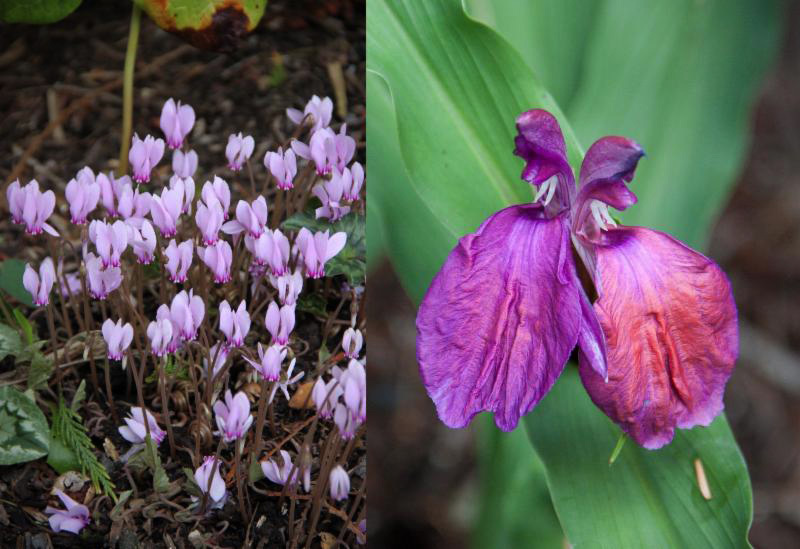 While you’re here, wander the Woodland Garden and try to spot as many different cyclamen and roscoea flowers as you can. What’s more, the Potager is bursting with blooming asters, dahlias and marigolds, while the Perennial Borders pop with purple leaves and flowers. Heronswood is a botanical garden of unparalleled beauty, even amongst the lush landscape of the Pacific Northwest. The woodland garden is located near Kingston, Washington on the north Kitsap Peninsula, and is open to the public during scheduled events and by pre-arranged tours.